Development of time standards, costing and performance standards. Selection of processes and assembling methods. Selection and design of tools and equipment. Design of facilities including plant location, layout of building, machines and equipment, material handling system raw materials and finished goods storage facilities. Design and improvement of planning and control systems for production, inventory, quality and plant maintenance and distribution systems. Development and installation of job evaluation systems. Installation of wage incentive schemes. Design and installation of value engineering and analysis system. Nowadays economic scenario is marked by increasing competition in almost every sector of economy. The expectations of customers are on rise and manufacturers have to design and products in order to satisfy them. Thus, there is a challenge before the industries to manufacture goods of right quantity and quality and at the right time and at minimum cost for their survival and growth. This demands an increase in productive efficiency of organizations. Industrial engineering plays a vital role in increasing the productivity. Industrial engineering techniques are used to analyze and improve the work methods in order to eliminate waste and proper allocation and utilization of resources. How can industrial engineering be defined? Industrial engineering can be defined as a profession in which a knowledge of mathematical and natural sciences gained by study, experience and practice is applied with judgment to develop the ways to utilize economically the materials and other natural resources and forces of nature for the benefit of mankind. Industrial engineering is concerned with the design, improvement and installation of integrated systems of men, material and equipment. It draws upon specialized knowledge and skills in the mathematical, physical sciences together with the principles and methods of engineering analysis and design to specify, predict and evaluate the results to be obtained from such systems. The prime objective of industrial engineering is to increase the productivity by eliminating waste and non-value adding (unproductive) operations and improving the effective utilization of resources. Productivity is the ratio of output to some or all of the resources used to produce the output. What is the productivity index? We can calculate a type of partial productivity as labor productivity as output per man hours for a complete year. These figures obtained from year to year can be indexed and can be related to a base year so that output per man our comparisons can be made. It is the ratio of tangible output and tangible input. Men, materials, machines, methods, money, energy, etc. are inputs. Industrial engineering plays an important role in any organization. Organizations are usually set up with selected industrial engineering functions best suited to their requirements. For example a company manufacturing standardized products may not have operation research functions whereas a manufacturer of precision instruments may heavily rely on quality control functions. Traditionally, industrial engineering involves different functions, which support manufacturing and service operations in order to improve productivity, safety and workers welfare. These functions, as in the past, are otherwise neglected by many entrepreneurs who are only motivated by profit. Developed countries have long ago realized the physiological needs of their citizens as their life style has improved with the abundance of material resources. Further, with an increase in educated workers, the demand for improved working conditions and better treatment from the owners of enterprises increased. The owners adopted many of the industrial engineering functions to satisfy the employees demand while still maintaining profitability. Gilbreth’s work continued in motions using motion pictures for studying tasks and workers. 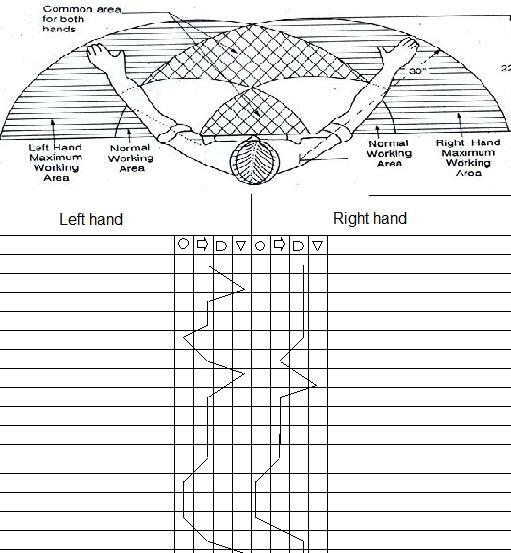 He developed micro motion study, a breakdown of work into fundamental elements called “therbligs” (baed on Gilbreth spelled backwards). Taylor’s concept of work element was broad, and based on time study requirements like “get tool”. Whereas Gilbreth’s work was based on breaking down the elements further into basic individual therbligs, such as “reach for tool and pick up tool” instead of “get tool”. There were many followers of Taylor and Gilbreth in the 1900s. 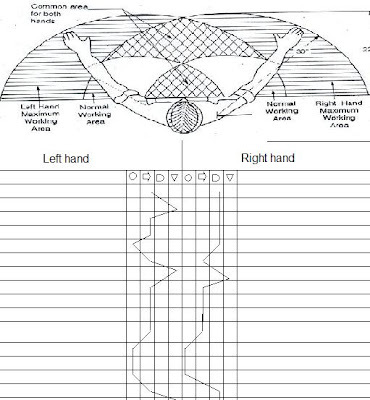 They believed that Taylor’s work emphasized motion measurement whereas Gilbreth emphasized motion analysis. With time, it became clear that both approaches were necessary and were essentially interdependent. Ultimately what is important is the best of both of these efforts, namely, the right motions with the minimum of time. Thus evolved a term “Methods engineering” which is an important function of industrial engineering. The concepts of time and motion studies developed by Taylor and Gilbreth are still the basis for industrial engineering. Even today, over fifty percent of industrial engineering activities are related to this concept. Frank Gilbreth, started working on motion studies soon after Taylor began his work. Gilbreth was a construction contractor, who noticed that the industry lacked standardization of methods. Gilbreth and his wife Lilian, devoted their lives to motion studies. Gilbreth’s famous discovery took place when he was doing apprenticeship as a bricklayer; he observed that there were no two men, who could lay bricks the same way. Consequently, their quality and quantity of output varied. He improved the method of laying bricks by making a number of changes. He provided a platform whose height could be adjusted, so that bricklayer is always at the same height in relationship to the bricks laid. A shelf for bricks and mortar was built to save workers from bending down to pick up their material. He had bricks pre-stacked with the best side facing in the direction of the workers to avoid workers from having to turn the brick several times to find its best side just before laying. These changes significantly reduced the number of motions in laying bricks, and resulted in higher production with lower fatigue for the workers. Lilian Gilbreth, Frank’s wife, joined him in his pursuit for promoting scientific management by conducting research and application work in studies of motion and methods. In any productive environment, whether it is an industrial plant, an institution such as a hospital, restaurant, office, etc. there is a need to improve the quality of work. This means that a given task should be carried out efficiently and accurately in terms of time and effort spent. During the industrial revolution of the 18th and 19th century, many small ownership based businesses grew into larger enterprises in which a number of manual tasks were performed by mechanical and steam operated machines. At that time there weren’t adequate tools or working conditions and there was considerable exploitation of labor. As a result, there were wide variations in output from different workers and different factories making the same product. Frederick Taylor, a mechanical engineer was who observed that better methods could be established even for a simple task as handling iron ore and coal for a blast in a steel plant. He pursued the task of establishing a norm for the weight and size of the shovel for scooping and transferring material. He observed and proved that instead of using the largest shovel to move the maximum material in a day, it was better to design a shovel which could be comfortably used by the workers on a repetitive basis without tiring or injuring them at the end of the day. When his plan was implemented, he reduced the manpower by over 25%. Taylor was also considered to be the father of scientific management because he was a pioneer in improving methods and establishing the incentive system for workers with the benefit of higher productivity to the owners and higher wages for the workers. Methods design is the analysis of the various ways a task can be done so as to establish the one best way. It includes motion analysis (the study of the actions the operator can use and the advantages and/or disadvantages of each variation) and standardization of procedure (the selection and recording of the selected and authorized work methods). While ‘‘time and motion study’’ is the more commonly used term, it is more correct to use ‘‘motion and time study,’’ as the motion study to establish the standard procedure must be done prior to the establishment of a standard time to perform that work. Attempts have been made to separate the two functions and to assign each to a specialist. Although motion study deals with method and time study deals with time, the two are nearly inseparable in practical application work. The method determines the time required, and the time determines which of two or more methods is the best. It has, therefore, been found best to have both functions handled by the same individual. 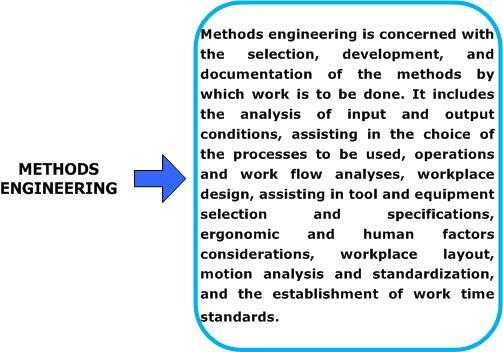 Methods engineering is concerned with the selection, development, and documentation of the methods by which work is to be done. It includes the analysis of input and output conditions, assisting in the choice of the processes to be used, operations and work flow analyses, workplace design, assisting in tool and equipment selection and specifications, ergonomic and human factors considerations, workplace layout, motion analysis and standardization, and the establishment of work time standards. A primary concern of methods engineering is the integration of humans and equipment in the work processes and facilities. Process analysis is that step in the conversion of raw materials to a finished product at which decisions are made regarding what methods, machines, tools, inspections and routings are best. In many cases, the product’s specifications can be altered slightly, without diminishing its function or quality level, so as to allow processing by a preferred method. For this reason, it is desirable to have the product’s designer and the process engineer work together before specifications are finalized.